Score a FREE large one-topping Papa John’s pizza if you correctly guess the coin toss before the Super Bowl. 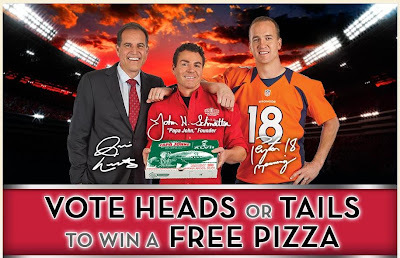 Just visit the Papa John’s Coin Toss and choose heads or tails to enter before February 2, 2013. If you called the coin toss correctly, you will receive an email by end of day Monday, Feb. 4, the day after Super Bowl XLVII, with a unique promotion code valid for a LARGE 1-TOPPING PIZZA redeemable at papajohns.com. If you didn’t win, you’ll still get a special coupon in your inbox. Up to 4 people can enter per household, so be sure your household casts a vote for each side! Your free pizza or coupon must be redeemed by March 10, 2013.